has to offer. In addition to a full kitchen with housekeeper, there are 2 queen bedroom suites with full baths, a single bedroom and half bath. The generous living and dining area are open to the sea. Sleeps 5 persons comfortably. along with outdoor grill and hammock hut are included. Sleeps 4 comfortably. These are two spacious private units with King beds, A/C in both units, and large seaview balconies. perched directly on the cliffs above the Caribbean. The Cove Cottage is a romantic guest room with beautiful French Doors opening to the patio. All the pillar houses are designed as tree houses with verandahs offering stunning views of the Caribbean Sea. SeaGrape 1 and 2 are situated on a small cove on the Tensing Pen property. 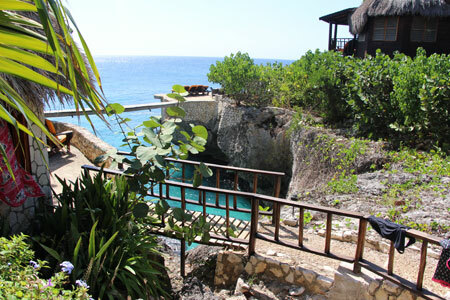 The patio is a little Caribbean cottage tucked into a private rock garden. A single day bed in the antiroom makes this a perfect cottage for 3. Tensing Pen offers 2 garden rooms and one studio situated in one building amidst tropical foliage. Garden A is the front unit of the Garden Building with a thatch roof verandah and bamboo armchairs with ottomans. Garden B is the most economical room Tensing Pen has to offer but equally charming. The Studio is perched upstairs in the Garden Unit with, high ceiling, king-size bed, large marble bath, and lovely verandah with bamboo loungers over the treetops. Located above Garden A & B, this spacious unit has a soaring thatch ceiling, large bath, and generous verandah with sea view. Bungalow is a bright and airy cottage with queen bamboo bed, large bath with rain shower, and generous verandah surrounded by tropical vegetation. Tensing Pen's most economical room. A hideaway sunken cabin surrounded by lush tropical gardens, farthest from the ocean. King size bed, AC, Garden View. Continental Breakfast is served daily from 7-11 AM in the open-air kitchen. seasonal tropical fruits, cereals, fresh orange juice, toast and jam. each meal is prepared with flavorful Jamaican flair. Menus are posted in the morning at breakfast. and two covered cabana type loungers. Sparkling private sea coves are perfect for swimming and snorkeling. Yoga - many guests enjoy the art of yoga in a special sea view yoga space that will bring you closer to Nirvana. Yoga sessions at 4:30 p.m. are $15. Private instruction can be arrange at a cost of $60.